It all started with an old trailer, and a heart for design. We were in between jobs and needing to find a creative outlet for the two of us (husband and wife) to enjoy and also make a prophet on! In walks this drabby (is that a word?!) 2010 Keystone Cougar Fifth Wheel. She was rough from the start, but our minds exploded with ideas as soon as we saw her! Remove the upper cabinets, add a gas range hood, imagine white hexagon tiles as a backsplash, gold accents! Wait! Could we fit a bunk here?! And so demo day came and went and we were left with the most beautiful piece of art we have ever created together: The Cougar Den - we affectionately call her. The best part about her?! She's for sale and she can make your tiny home dreams come true! uploaded The Cougar through Add A Home. "Nobody thought it could be done," states Lauren. "I painted the design plans and posted them on our social media. I'm positive people thought we were foolish wanting to make this old RV look like a tiny home, but voila—isn't she a beauty?" Here is a look at the kitchen before the revamp. In order to stretch their renovation budget further, the couple did most of the work themselves. The couple have named the revamped trailer the Cougar Den. A view from the hall looking down at the kitchen! By combining a carefully chosen selection of items from Home Depot, Walmart, Target, Lowes, and IKEA with vintage and designer accessories, the couple have managed to infuse a variety of styles into the camper, while staying within their budget. 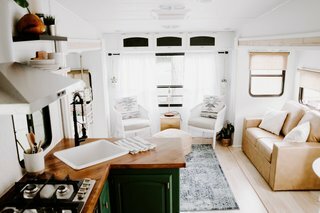 The couple enjoyed the renovation process so much that they have since launched an RV design and remodeling business called The Arrow Anglers. This amazing love seat has storage underneath the seat cushions! Isn't that genius? Especially in a trailer! This area now makes a beautiful spot to curl up and read a book. The biggest changes were made to the kitchen. Here, they removed all the cabinets in the upper section and added open shelving, a vent hood, a backsplash of white hexagon tiles, and lovely gold accents. To maximize space, they added bunk beds to an area that was previously a slide-out entertainment center, and also included storage underneath. Can't you picture a cute kiddo curling up and reading a book on this bunk?! They installed new pull-down shades to give the windows a more modern look. Cedar shiplap and wallpaper have also been used for the accent walls. "The bathroom may have been my favorite transformation," explains Lauren. "I spotted some beautiful inspiration from Studio McGee and I was hooked on the floral wallpaper idea." This is what floral wallpaper dreams are made of! The towel rack added the perfect little does of rustic to this beautiful modern bathroom! "We decided to bring the kale-green shade from the kitchen into the bedroom by painting the wardrobe green," adds Lauren. Snuggle up quick on this bed and you are sure to fall asleep dreaming of your adventures tomorrow!